"Some people fail to remember where power is derived from," threatens Robert Gabriel Mugabe, the president of Zimbabwe. He would know. He's been the de facto leader of Zimbabwe for decades. As he faces the completion of a new constitution, the possibility of term limits and a decline in his power, he is dismissive. Will Zimbabwe ever have real democracy? Douglas Mwonzora and Paul Mangwana in the documentary Democrats. Mugabe's ascent to totalitarian supreme leader began when he led the Zimbabwe African National Union (ZANU) in the '60s, who rose up against the conservative white-minority government of what was then called Rhodesia. In 1980, when the country became independent and called Zimbabwe, he was elected Prime Minister. ZANU metamorphosed into ZANU-PF, he ruled a one-party state and ran a deadly security force called the Fifth Brigade, which stifled rebellions and reportedly was involved in ethnic cleansing that killed thousands. In 1987 Mugabe became President with unbridled powers over other branches of the government and army. 2008 posed a big wrinkle for his leadership: a parliamentary election caused the creation of a coalition government and the Constitution Select Committee (COPAC) tasked with the responsibility of writing a new constitution. Enter the very alarming and revealing documentary Democrats, which thoroughly catalogues the constitutional process and how difficult it is to remove an embedded leader. Miracle of miracles, Denmark-based filmmaker Camilla Nielsson gets open access to the precarious grassroots procedures taken by Mugabe's ZANU-PF party and the opposition party Movement for Democratic Change (MDC). The two factions take a survey of public opinion to ensure a people-driven constitution. Nielsson, along with cinematographer Henrik Bohn Ipsen, is not a fly on the wall. She's in the thick of things. She sees, hears and witnesses everything, and even voices her opinions. asked their opinions about judgeships. Many proclaim, "The President should appoint all judges." Really? Is that what they really think? In the U.S., after almost 250 years of democracy, with three separate branches of government that fight like cats and dogs yet remain fiercely independent, we forget how hard it was to form a government that works for the people. As you watch this eye-opening experience, you learn why other countries are having such a difficult time giving birth to basic freedoms. You see that dictators who don't want to relinquish their power find ways to sabotage the will of the people. Director Camilla Nielsson spent three years following the creation of Zimbabwe's constitution. It's a marvel that she wasn't arrested for exposing corruption and the arrests of the opposition party leaders. Also, credit her wisdom; she knew when to stay in the background, when to speak up, and when to express concerns. Mwonzora is an obvious protagonist who almost became a martyr. 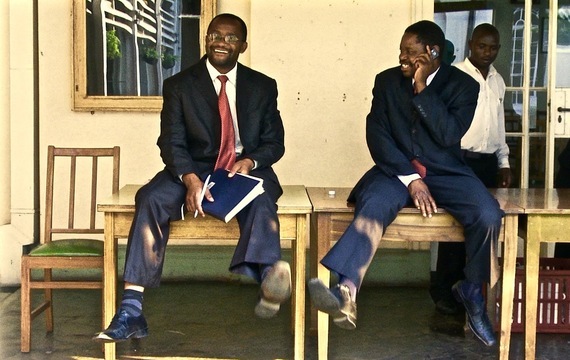 Mangwana, simply by continuing to negotiate in good faith, for his own party, risked the ire of President Mugabe. One of this doc's most dramatic scenes is when Mangwana is accused in the press of deserting Mugabe and the government when he almost allows a provision in the constitution that prohibits a president from serving more than 10 years. That would have meant the end of Mugabe's rule. Mangwana fought back against the provision, for the good of his party and possibly saving his life. It's all on view. You can't make this stuff up. Mother Africa must have been watching over Mangwana and Mwonzora. Why? Because they're still breathing. Be patient. In the beginning this documentary seems like it's merely following a bunch of squabbling politicians haphazardly surveying citizens and creating a document. As the 99 minutes of footage rolls by, judiciously edited by Jeppe Bødskov, you realize you're watching history in the making and the devious behavior of an old crafty rooster, President Mugabe.